PHOENIX — A coalition of Spanish-speaking radio and television stations and newspapers is encouraging Latinos to register to vote. 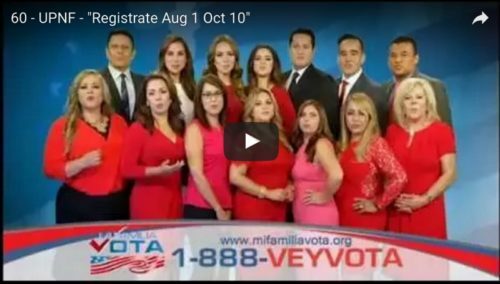 BuzzFeed reports that the campaign, headed by voting group Mi Familia Vota, is hoping to increase Latino voter registration by Oct. 10, the deadline to vote in the general election in November. The coalition of stations includes Univision, Telemundo and Azteca America, among others. Ben Monterroso of Mi Familia Vota told BuzzFeed that the group hopes to defeat both Maricopa County Sheriff Joe Arpaio and Republican presidential nominee Donald Trump — both of whom have been critical of Latinos — in November’s election. The group will use phone banks and radio and television spots to encourage Latinos to register to vote, either in-person or by mail-in ballot. U.S. Rep. Raul Grijalva (D-Ariz.) said he supports the idea because of his state’s roll in the immigration battle over the past years. “We’ve been the petri dish for every kind of law that is anti-immigrant and anti-Latino as a reaction to this accumulation of Arpaio, [former Gov. Jan Brewer,] border militarization, and the racial profiling,” he told the website.